Over the past several years, DNA sequencing has undergone a dramatic transformation in speed and throughput. Instead of the traditional approach of sequencing one small (several hundred bp) DNA region at a time, using a specific pair of complementary primers targeted to just that area of interest, the new sequencing platforms utilize a shotgun approach, randomly shearing the entire genome into over 300 million small fragments, sequencing each of them repeatedly in parallel, and then reconstructing the resulting sequences, using sophisticated computer software, into the complete genome. This “next-generation” or “massively parallel” DNA sequencing technology has truly been a “game changer,” allowing for practical and timely sequencing of large panels of genes, of all the coding regions of the genome (the exome), or of the whole genome itself in the clinical setting. 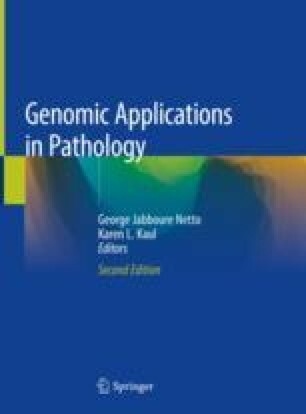 This chapter will review the major NGS platforms currently in use, as well as the interpretive and ethical challenges involved in filtering through the countless sequence variants observed to generate a meaningful clinical report. Supreme Court of the United States. Association for Molecular Pathology et al. vs. Myriad Genetics, Inc.; 2013. http://www.supremecourt.gov/opinions/12pdf/12-398_1b7d.pdf.